It’s been awhile since we’ve taken an aerial look at the activity going on outside of Tesla’s Fremont factory in California.Tesla’s 5.5 million square-foot manufacturing plant for the Model S, Model X and the upcoming Model 3 that’s slated to go into volume production during the summer of 2017, sits on a 370-acre lot that was once home to GM and Toyota. Since the last seen drone video of Tesla’s manufacturing plant, taken over a year ago by an employee, the factory has gone through some significant updates. Most notably, Tesla completed the build out of its second production line to support production ramp of its Model X electric crossover SUV. The factory had also carved out more room for a new body production line that can switch between Model X and Model S vehicles based on demand. Construction of a new state-of-the-art paint facility had also been completed at the factory. 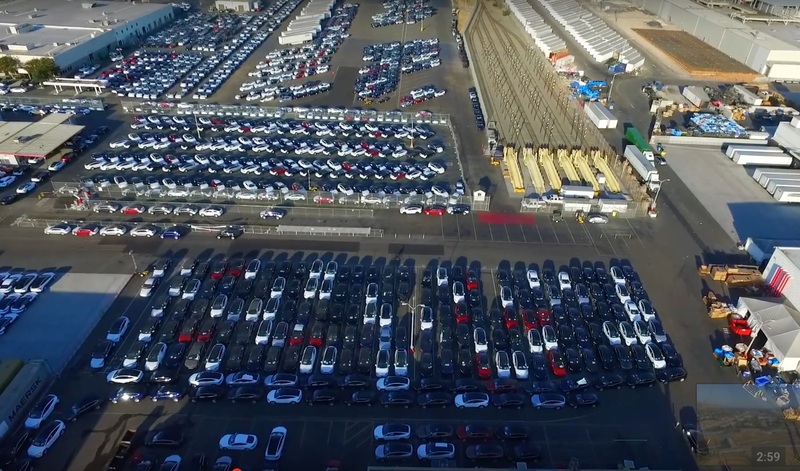 The latest drone video taken this month provides an amazing look at the hustle and bustle taking place at and around Tesla’s Fremont factory. What’s notable is the amount of Model S and Model X inventory stationed outside of the factory, likely awaiting pickup by their new owners. A seemingly endless farm of shipping containers along with the Tesla test track can also be seen from the aerial shot. We wouldn’t be surprised if keen-eyed observers ended up spotting a Model 3 within the mix. Leave us a comment below if there’s something notable that you noticed in the video.